A special thanks to NBC directors and staff David McNeece, photographer and Branden Reynolds, author for the following article featured in "NBC's Oklahoma Artist Series 2003-2012". Mitsuno Ishii Reedy can’t remember when she became an artist but she can remember when she gave up art. And, luckily, she also remembers when she rediscovered it. The troubled journey to embrace her craft isn’t obvious in her current work, but it’s a part of it. Since the early 1970s, Reedy has been a professional portrait artist, painting children and families, doctors and military officers, Oklahoma Governor Brad Henry and tenor Luciano Pavarotti. Born in Japan, Reedy came to the United States at the age of 20, living in Kansas City, Oklahoma City and Lubbock and Austin, Texas, before settling in Norman – although “settling” may not be the right word, because Reedy goes where her art guides her. “I immediately thought of doing a portrait of an Indian princess or something,” she said, thinking she would add cherry blossoms to connect it to Japan. Through a friend, she found a model in a chief’s granddaughter in El Reno and began. Both cultures created art, in woodcuts and paintings, which emphasized flat shapes and outlines. In her piece, Beauty and Strength, the Native American girl has become three princesses. Reedy painted the faces to suggest the shared genetic heritage of the Japanese and Native American peoples, reinforcing that connection (which Reedy herself embodies in her own migrations) with cherry blossoms, Indian blanket wildflower and, flying overhead, a scissor-tailed flycatcher, the Oklahoma state bird. The stylization may be familiar to the two cultures depicted, but it’s a departure from Reedy’s realistic portraiture. That made her uncomfortable at first, but she quickly embraced the chance to experiment as an artist. She wasn’t always this way. Once upon a time, she was afraid to be an artist. Reedy grew up outside the city of Osaka, Japan, in the years surrounding World War II. Her father went off to fight in 1944, when Reedy was three. An early memory suggests her fascination with color, even amid chaos. Her father was killed in the war, leaving her mother to raise two daughters and a son. What she saw outside her classroom window inspired those early drawings. The first conflicting feelings of excitement and insecurity arrived in the third grade, when she won a regional art contest and was sent to the city to participate in a workshop, where a famous artist was going to teach the award-winning students. “I remember going there by myself on a train and standing in the big studio with eagles, and a model was in the middle, and we were supposed to draw,” she said. “And I remember not understanding what the teacher was saying, and having to look over the shoulder of a high school student who was next to me, and imitating what he was doing. And I got so scared that if I drew anymore, I was going to get into trouble like this. For years, that was it for her. Reedy studied calligraphy, but beyond that, didn’t pursue art. What she did pursue, however, was America. So Reedy studied English, and began corresponding with pen pals all over the world. A woman sent her a dollar in a Christmas card; she used it to buy a dictionary. Eventually, she started corresponding with a young medical student in Kansas City. “He was just a charming person. And he loved to write so he’d write to me every day and I would write back every day and he’d send me pictures. And he said he wanted to marry me!” she said. And that is how, at the age of 20, she ended up in Kansas City. She had a child and dedicated herself to being a wife and mother. She divorced and remarried, and moved to Lubbock with her second husband. She became depressed. A visit to the doctor revealed that nothing physically was wrong, and after hours of talking, the doctor has a prescription: Sign up for art classes. 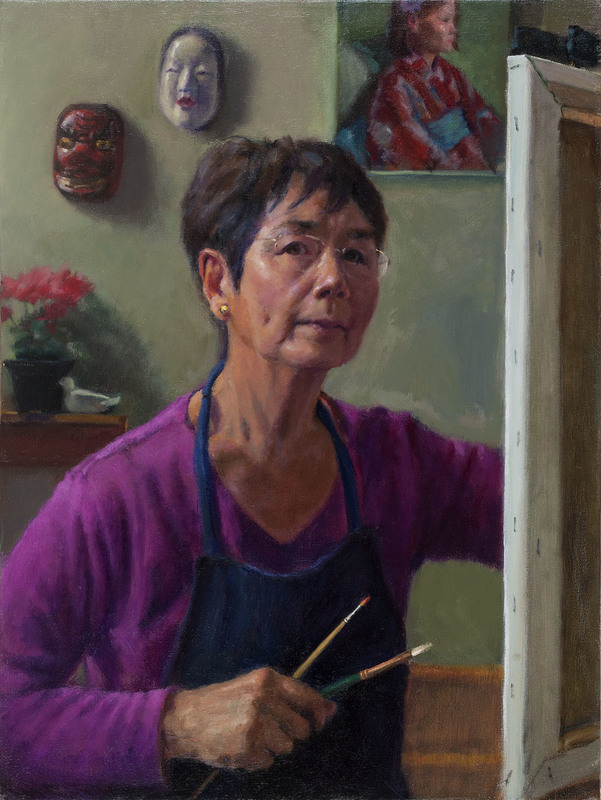 She began taking classes in Lubbock, studying realist painting; therefore, she picked up where she’d left off in that studio in Japan. But in 1970, at the age of 30, Reedy needed that new experience, again. Except it isn’t. Not quite. Because after four decades as a successful portrait artist, Reedy decided that she finally needed to attend art school. So she decided to confront the workshop directly. In August 2011, she took a two-week course at the Studio Incamminati School for Contemporary Realist Art, in Philadelphia. It was yet another trip to yet another strange city, but she was excited to discover it. Reedy has been doing a lot of unlearning at Studio Incamminati, Rebuilding those lost years of art. She says the school’s name means “those who are progressing.” A more literal definition is “to make one’s way,” or “to set off,” which is appropriate. Reedy has spent her life perfecting the art of setting off.